Wake Up, This Is Your Life! 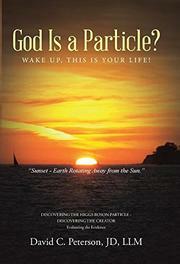 A debut book argues that recent discoveries in science confirm the existence of God and a transcendently purposeful life. According to Peterson, readers are confronted with two mutually exclusive options for understanding the universe: either it is the inadvertent result of random physical forces and human life is shiftlessly arbitrary, or the cosmos was thoughtfully designed by a supreme intellect and individuals are guided by a profound spiritual destiny. The scientific community, he contends, has been far too dismissive of the argument for intelligent design, assuming that a very narrow conception of physical causation commandeers a monopoly on the market of reason. But all that changed in 2012 when scientists discovered the long sought-after Higgs boson particle, commonly referred to as the “God Particle,” because of the extraordinary scope of its causal and explanatory power. Really a field rather than a particle, the Higgs boson is the ultimate building block, both the cause of all matter and the source of its rational organization. Everything that exists is essentially energy, and the Higgs boson provides the DNA-like instructions for all energy particles, which are the core constituents of the atoms that make up molecules. This level of order and perfection, Peterson avers, repudiates the view that the world is an accident, a cosmic fluke. The author considers other recent scientific revelations as well, including a new understanding of infinity, black holes, gravity, and magnetism to further cast a pall of suspicion on the rejection of intelligent design. Peterson is a lawyer, not a scientist, but his grasp of the most recent advancements in physics and cosmology is impressive, and he’s skilled at marshaling a persuasive argument. He also knowledgably highlights the empirical gaps in evolutionary theory, especially with respect to human life and the emergence of consciousness. But despite his commitment to epistemological openness, Peterson’s tendency is to convert thousands of years of philosophical disputes into an open-and-shut case, declaring the outright victory of intelligent design. He’s at his best when, instead of intellectual stridency, he acknowledges the irresolvable mystery of the universe. A provocative and well-researched stand for intelligent design, weakened somewhat by overconfident conclusions.